I first saw this mad-man on one of those cookie-cutter Facebook posts with a saccharine headline similar to "Wise Mad Man Gives You The Best Life Advice You Will Ever Get". For any reason anyone clicks on those things; I did with little expectation. 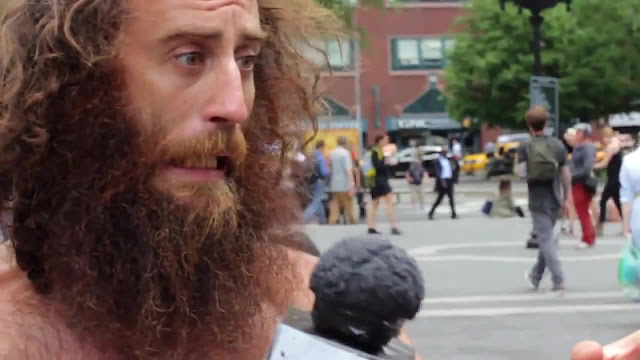 I watched a wild-eyed Matthew Silver rant with a distant look in his eye about love, life, and happiness. At the surface, I appreciated the message about life being an adventure and loving profoundly. I watched again and dissected his rant and it was more meaningful that I thought, it stuck with me. I told myself, this guy can't be a real crazy person, there is a little glimmer of brilliance behind this man. In the description of this video, I noticed the name Matthew Silver and how he is a street performer in NYC. It instantly reminded me of something Kaufman would have (and has) done. Extracting real guttural reactions from real people by transforming yourself into a limitless character with no social restrictions. His character gracefully embraces the outer fringe of everyone's comfort zone and preaches about loving people, living life, and appreciating every day with a dash of fart noises, chicken clucks, and distant stares. Every word he speaks seems like a child learning a new skill or word where it's delivered with such joy, wonder, and enthusiasm. It can be admired as madness or pity, curiosity or art, a nuisance or a performance but he's remained an NYC stalwart for almost a decade now. When the above video was filmed, it was by accident, went viral and here we are. I admire Matthew for his commitment, talent, and message. He does not compromise his performance to conform to traditional comedy. The complete transformation into his character reminds me of just with the widening of his eyes Kaufman turned into Latka and with a snarl in his lip turned into Elvis. Seeing Silver perform is like watching a total transmutation of one person to the next like this "lunatic bum" is steering the ship for a few hours. The visceral body movements and the delivery of inspirational cat-calendar worthy quotes take you on the same journey he is on and connects you with him. Stripping away all the pretentious masturbatory needs of an artist, his message seems more profound and more impactful. Silver loves farts and loves love. It's for this reason, I am inducting him into the construxnunchux Hall of Fame for 2016 as I hope all of his hard work and commitment to spreading love continues for as long as he is fulfilled by it.